Jimmy Fallon was in a bandage again on Monday night, but not due to a new injury. Jimmy Fallon's hand was in another bandage Monday night, but this time it was not due to a new injury. 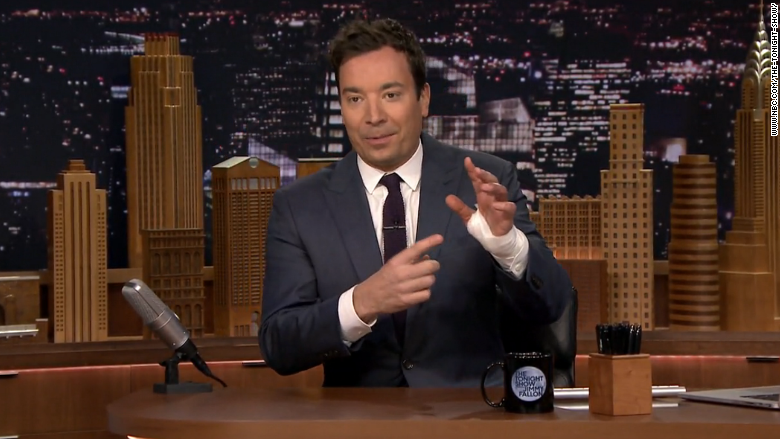 "I should say if you're watching, this is not a repeat," Fallon said on Monday's "Tonight Show" pointing to his bandaged hand. "This is a planned surgery. I didn't fall or anything." Fallon explained that after he nearly lost a finger in June, he still doesn't have feeling in his ring finger and pinky on his left hand. "Because that happened it kind of hindered the nerves coming back," he said. "This is what happens when you're 41 years old." "We'll see what happens in six months or whatever it takes for the nerves to come back, but [the bandage] will be here for another week," Fallon said. "So just put up with me in bandages for one more week and then I won't do it again, I promise." "I'm going to be back, don't count me out," he said. "I'll be playing guitar in a year."